The growth and expansion of ‘solutions’ provided by the ‘personal growth’ movement continues at a relentless pace. Almost daily there is a new promise, a new method or intervention (often old ones repackaged), and yet the human condition continues its march towards further confusion, unhappiness, pain and, for many, despair. There are undoubtedly examples of ‘real’ progress but they tend to be the exceptions rather than the rule. For the majority of us there is at best a loss of contact with the self, as we walk trance-like through our lives, not really sure where we are going. There are growing numbers whose lives have lost meaning and purpose as they struggle with doubt, fear, anxiety, guilt and shame. Until our obsession with immediacy (must have it now!) is conquered we are in danger of trading in the present moment for ‘something better’ (only to find something better has passed us by but we simply haven’t noticed). The ‘quick-fix’ approach has become the mantra for our time. But if we are not careful, we’ll come to expect all things can be fixed quickly which is simply not the case. Of course there are some instances where a plaster or bandage will do the job. Just as there are times when a few stitches and a bowl of soup will be sufficient. However there are just as many times when something more is needed: an operation, a bed and a period of rehabilitation. We believe that the plethora of promises, methods and interventions have seduced many away from the simplicity of what is needed. It is our hypothesis that all we need is the ‘right’ knowledge, plus application, which equals personal power (power born of experience). If you look at the chart, you can see the primary objective is to get from the ‘old and familiar’ to the ‘new and unchartered’. The space in between these two positions illustrates the journey from one to the other. On the path of personal growth, we all want to be living under the canopy of the new and unchartered and be free from the old and familiar. Unfortunately for many (we believe most) this is not the case as we are often living ‘recycled pasts’ – posing as the now! So why are we held hostage by our pasts, patterns and habits…? The answer is simple. We’ve not understood the power of application: it’s not what we know but what we do that counts. No matter how much knowledge we’re surrounded by, it will never be enough to dethrone the demons of the past. It’s when we ‘breathe the life of practice’ into that knowledge that it truly becomes a force to be reckoned with. So let us explain the simple formula we’re alluding to because we are confident it’s all you really need to know… Knowledge + Application = Experience (Personal Power) … When one starts out on the road of personal growth it is with the desire to leave behind one’s unwanted and often out-dated moods, tendencies, fears, anxieties, doubt, panic and much more. There are those who take the journey simply to find out who they really are. Whatever the motivation, we are all seeking to feel better in our own skins. In order to achieve that, increasing our knowledge is a must. By increasing knowledge, our awareness and understanding will expand too. As a result we can then see, smell and taste the promise of a better tomorrow. Unfortunately, many want the fulfilment of that promise today! This urge (impatience) becomes so strong that their new-found awareness and understanding can quite quickly become replaced by dissatisfaction which can even become anger and despair. These feelings often lead to a relapse, back into the old and familiar, so instead of enjoying the euphoria of countless possibilities offered by the newly discovered knowledge, the individual can once again find herself snared by self loathing, fear, pain, panic, guilt, procrastination etc…Why?…Usually it’s because they’ve not crossed the bridge from ‘Knowing to Doing’. They’ve seen and been seduced by the prize but they haven’t really understood what’s required to transform the self. Application is the missing link. The new and unchartered will remain just that without the application of knowledge. It is often some form of life-challenge that clouds our judgement, obscures our vision, causing us to stumble and with that become disheartened. 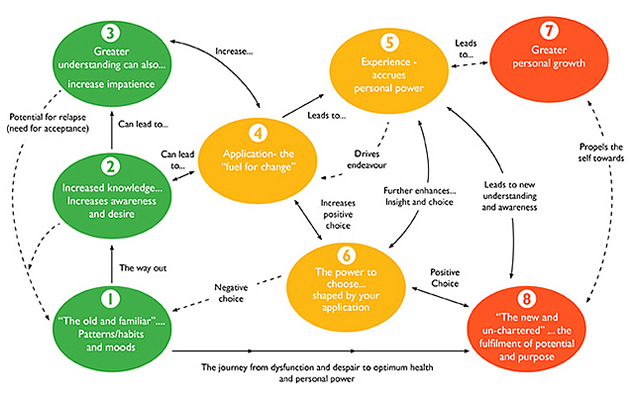 Life-challenges come in many forms: our relationships, the demands of work, ageing, illness, depression, change in circumstances etc… It is at this point where knowledge alone is rarely enough and therefore relapse(s) can occur. If on the other hand there has been application of that knowledge, personal power increases, which offers the opportunity to ‘choose’ the new and unchartered rather than slip back to tiresome and ineffectual patterns and tendencies. So practice is the key – this is a message that has echoed through eternity. Excellence is a virtue that has been repeatedly applied. It often takes faith and courage to move from being an intellectual and theorist to becoming a humble practitioner of the principles for self-transformation. Having understood the message, one needs to simply jump – take a leap of faith, because only then can you truly ‘know’. There is a level of knowing and understanding that is beyond books, workshops and conversations. It is a knowing that sees beyond the limitations of logic and the senses but how can we know this for ourselves…? The answer is through practice because without our own experience, that ‘intuitive knowing’ remains beyond our grasp. This is why we urge you to practise what you know, removing the contradictions from your life, and to become passionate about “doing the right thing”. Follow the moral compass offered to you by your heart. Practise being still and listen and you will hear and feel its guidance. The more you apply knowledge the more experienced you become and it is that experience that allows you to peer into the unknown, see the unseen, hear the unspoken and feel that which has yet to be written. This kind of experience offers unimaginable knowledge and insight, which then takes you further down the road of personal growth. This allows you, instead of being driven by your life, to take the wheel and drive for yourself. So don’t get caught up in the promise of the modern age, looking for the ‘magic bullet’, the one thing offering a solution to everything. Realise that any knowledge that leads you away from synergy, integration and inner peace is best viewed with suspicion. Trust your heart more but don’t ignore your head, listen carefully to both and you’ll feel the truth when you are in its company. Try not to act from a place of desperation because usually both your ears and your brain are disengaged at that point. We spoke earlier of applying the ‘right’ knowledge and this is a contentious issue because one can always ask what is “right” knowledge? Until you’ve discovered for yourself what is right, we offer you a simple formula. If the knowledge ‘feels’ right to you, trust yourself and apply it in your life. The fruit of your choices will then make themselves known. You will in time see for yourself whether it was indeed ‘right’. This is where both faith and courage are needed because there are some things you cannot know without leaping into the dark and finding out. Don’t be afraid to make mistakes or to risk looking silly, for the prize of peace, contentment and a truly fulfilled life awaits you. Knowledge + Application = Personal Power. The personal power that is generated will carry you fearlessly into a life that is new and full of promise…Dare to take this journey: you won’t regret it for a moment.